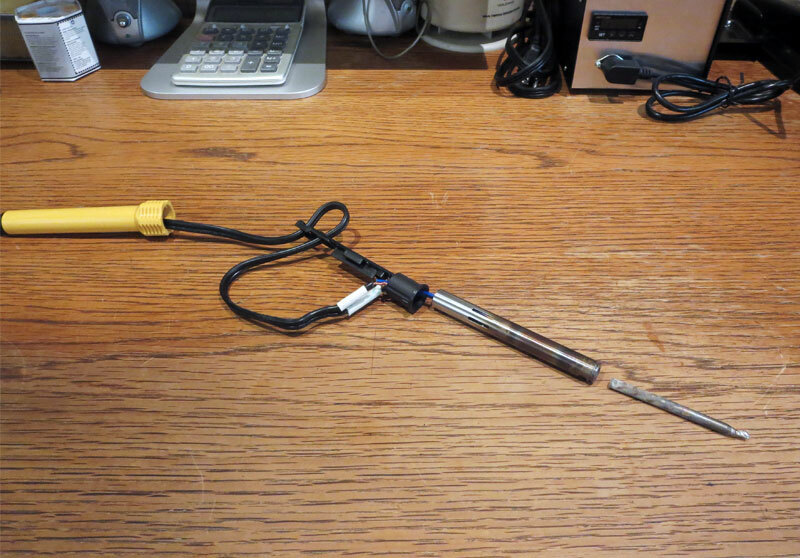 This post shows how to add a K-type thermocouple to a 120 volt plug-in soldering iron for use with a PID temperature controller. 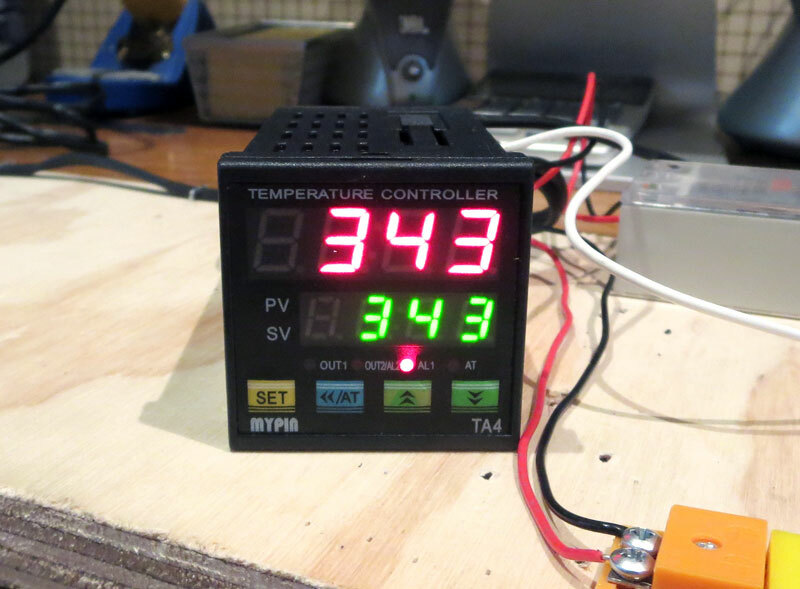 This is a follow up to a previous post on the Soldering Iron PID Temperature Controller. 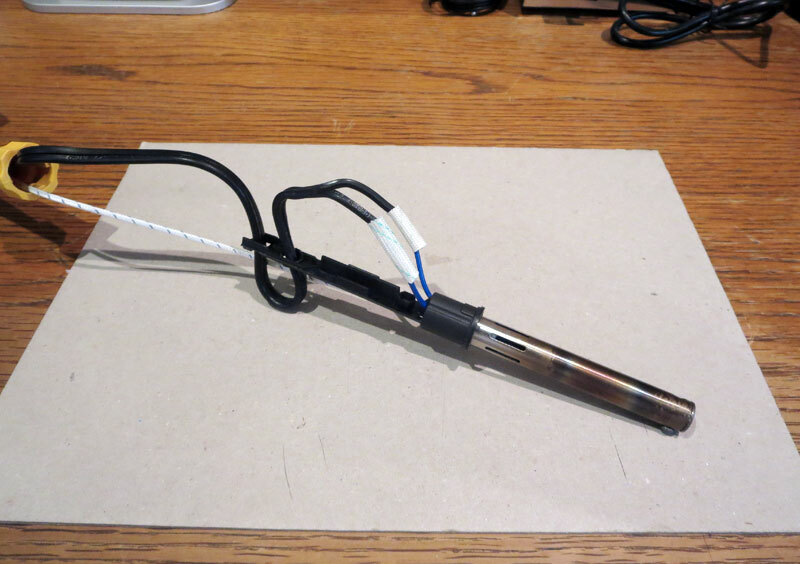 Please see the previous post for more details on how to add a thermocouple to a plug-in soldering iron with a mica heating element. The method I used here was basically the same. This second version has a few improvements. It uses a better soldering iron that gets hotter and heats up faster. 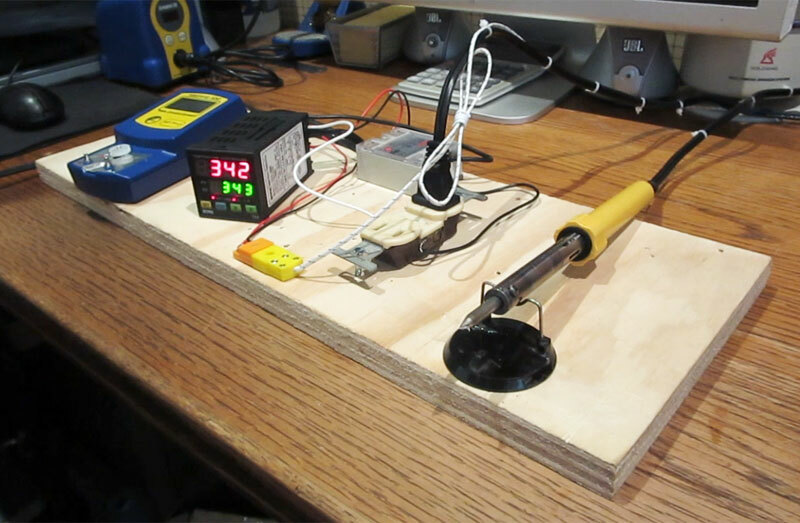 The PID controller is able to work at higher temperatures than the previous version plus this version uses an SSR to switch the soldering iron on and off. 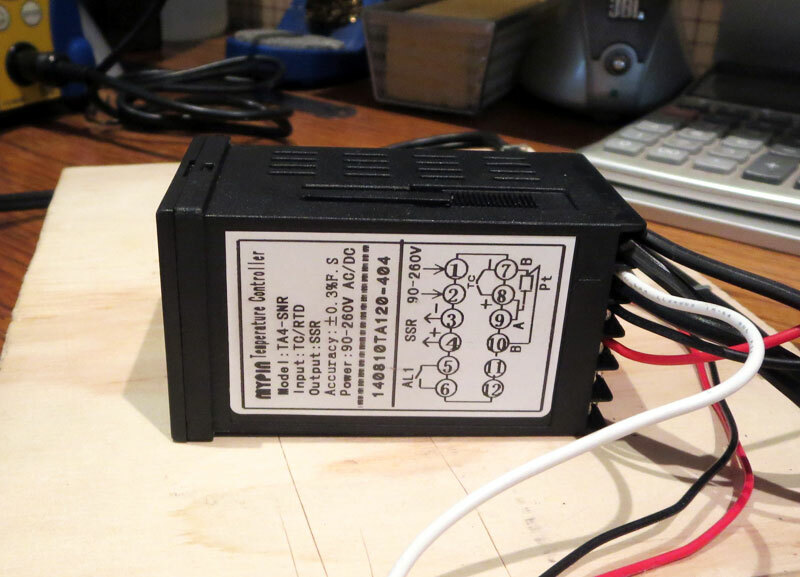 The solid state relay has no mechanical parts to wear out plus it is capable of much more precise switching than a mechanical relay. 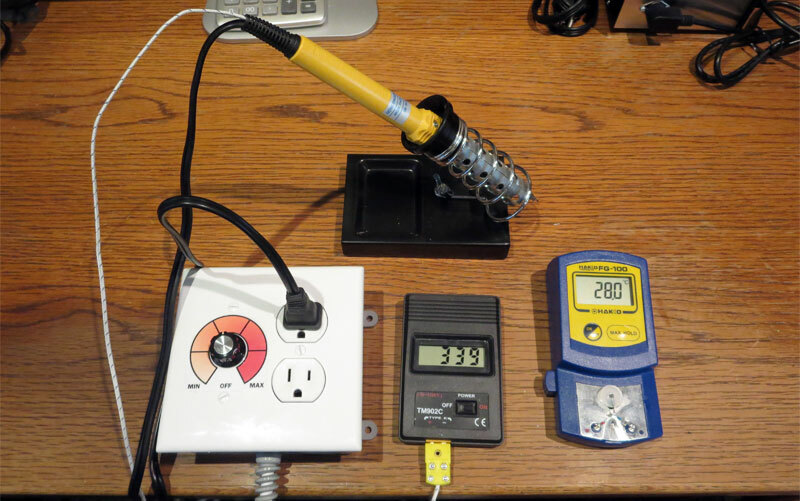 The total cost for the soldering iron, PID controller, SSR and thermocouple was just under $32.00 USD. All of the parts are available from online suppliers. WARNING!! 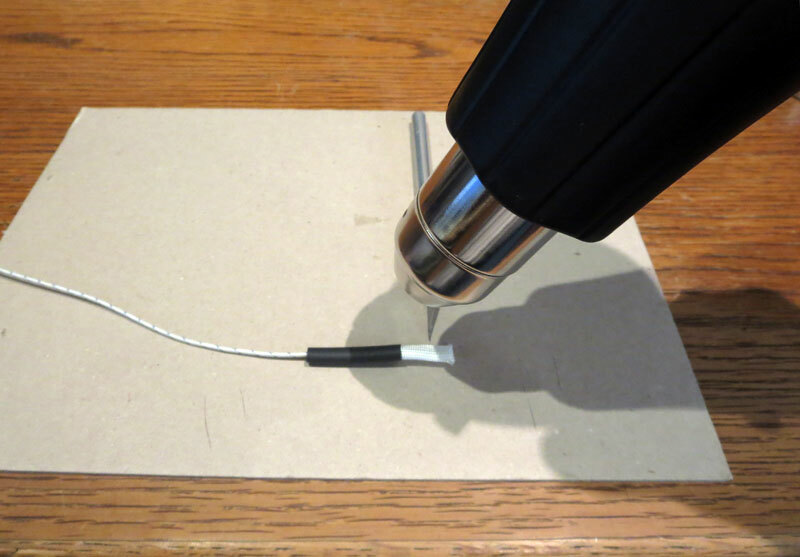 – DO NOT ATTEMPT to modify a soldering iron unless you know what you are doing! There exists a possible danger of electric shock WHICH CAN BE FATAL. If you attempt to modify a soldering iron for a purpose for which it was not intended, you do so at your own risk! The soldering iron used in this version is an SE model number PN60UL 120 volt 60 watt unit. The best deal I found online was from allelectronics.com. 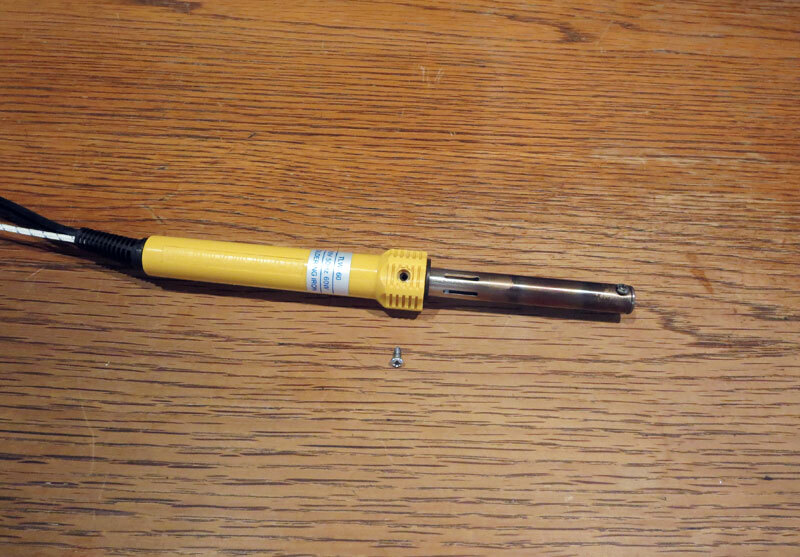 It is listed in their catalog as a “60 Watt Hobby Soldering Iron” and it sold for $7.95 USD. 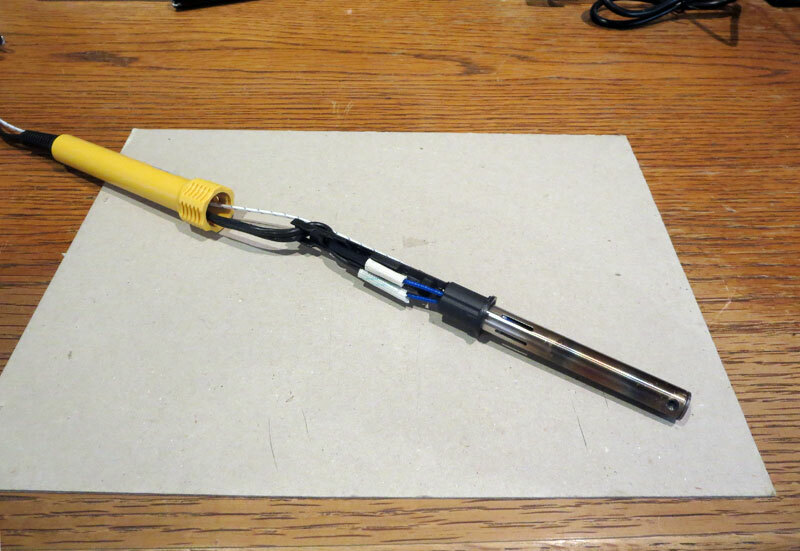 The photo below is how the soldering iron looked before any modifications. This model has a yellow plastic handle although there are other similar models on the market with different color handles. 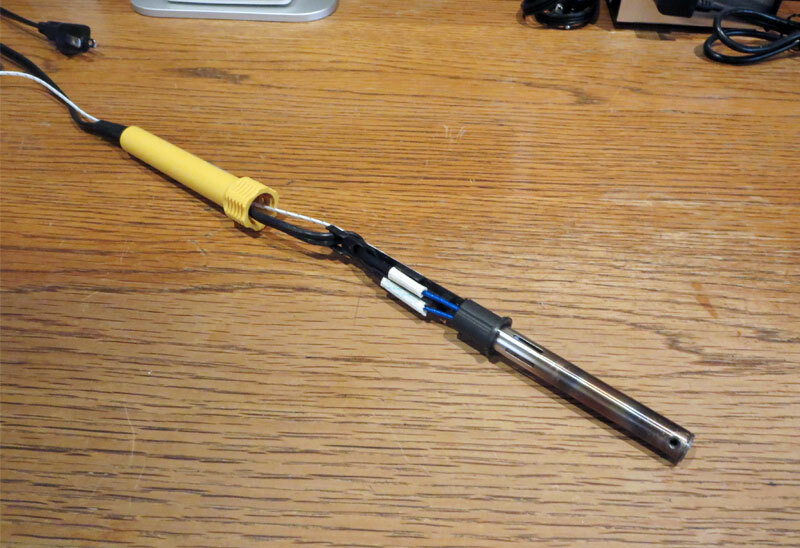 This soldering iron reached a maximum of 442°C for me, which was a little more than 50°C hotter than the first version. I was happy with how hot it gets. 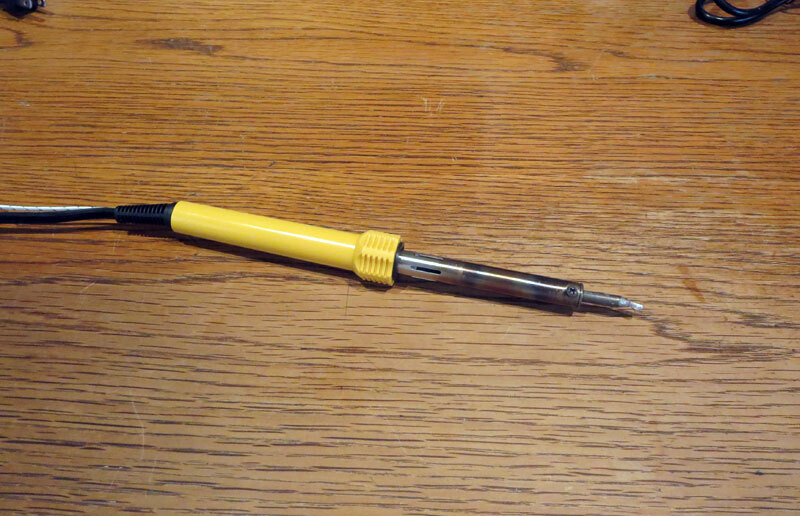 I believe it is a better soldering iron and that it performs much better than the first version. The first step was to tear down the unit to figure out how to best go about making the modification. The two screws holding the soldering tip were removed and the tip was removed. A small screw in the hexagonal part of the (yellow plastic) handle holds the unit together. Removing the screw allows a (black plastic) insert to be separated from the handle along with a metal enclosure tube that houses the heating element. The photo below shows the cord strain relief boot also separated from the handle. It was reattached because its removal was not necessary for the modification. The heating element enclosure tube was separated from the handle insert. Then the power cord was pulled through the retaining slots in the insert to give it some slack. The twisted wires that connect the power cord to the heating element are covered with short lengths of PVC silicone fiberglass insulation. The pieces of insulation were slid off the connections and the wires were disconnected by untwisting them. 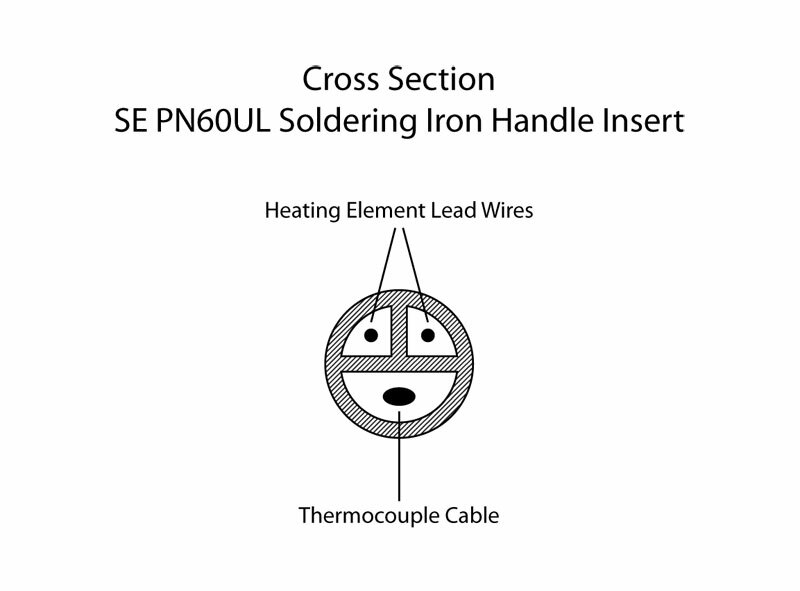 The connections were not soldered, which was convenient, because the unit would probably need to be disassembled and reassembled a number of times to find the right location for the thermocouple. Once the unit has been disassembled the thermocouple must be threaded into the unit. Insert the tip of the thermocouple into the strain relief boot where the power cord exits the rear of the soldering handle. 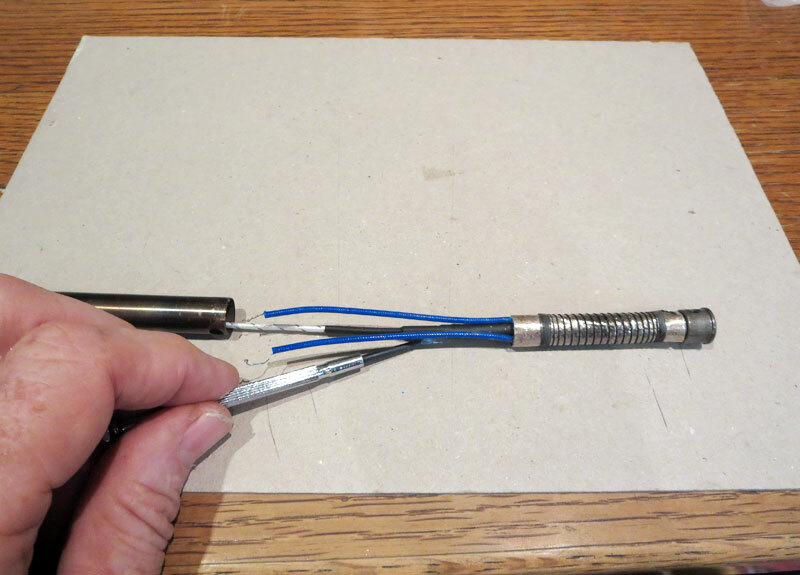 Thread the thermocouple through the opening in the handle insert opposite the two openings where the heating element lead wires are threaded similar to the photo below. The heating element lead wires are threaded through two openings in the handle insert. There is a third opening conveniently located on the back side of these openings which is ideal for routing the thermocouple cable. Please see the diagram below for clarification. 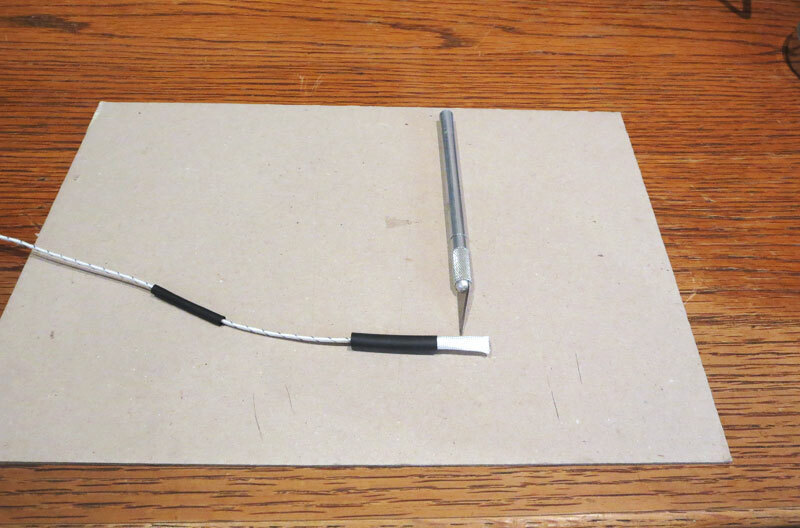 The photo below shows the heating element along with a two meter long K-type thermocouple (rated at -50° to 700°C) plus lengths of heat shrink tubing (1/8 in and 3/16 in) and 4mm ID fiberglass sleeve (rated at 600°C). The thermocouples were $1.67 USD each when I bought 5 at a time. 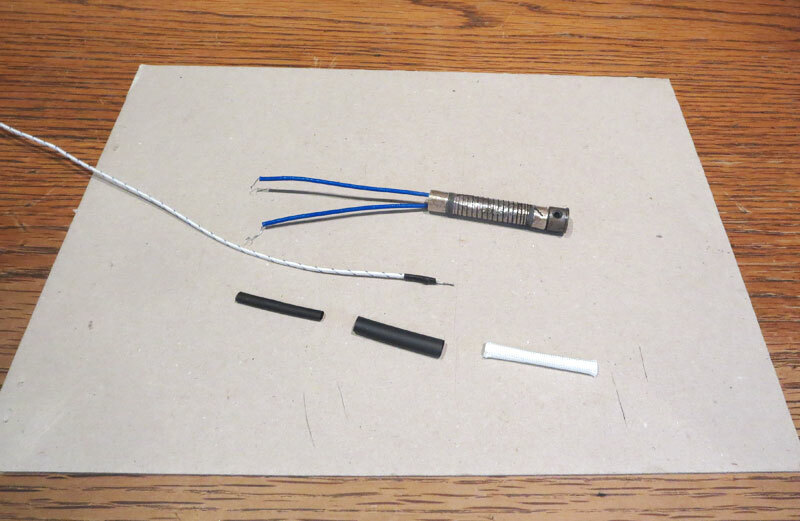 In the photo below the 1/8 in heat shrink tube is threaded onto the thermocouple first, followed by the 3/16 in heat shrink tube and then the fiberglass sleeve. The utility knife blade is pointing to the location of the tip of the thermocouple inside the fiberglass sleeve which has not yet been secured into position. A heat gun is used to secure the 3/16 in heat shrink tube to the fiberglass sleeve. 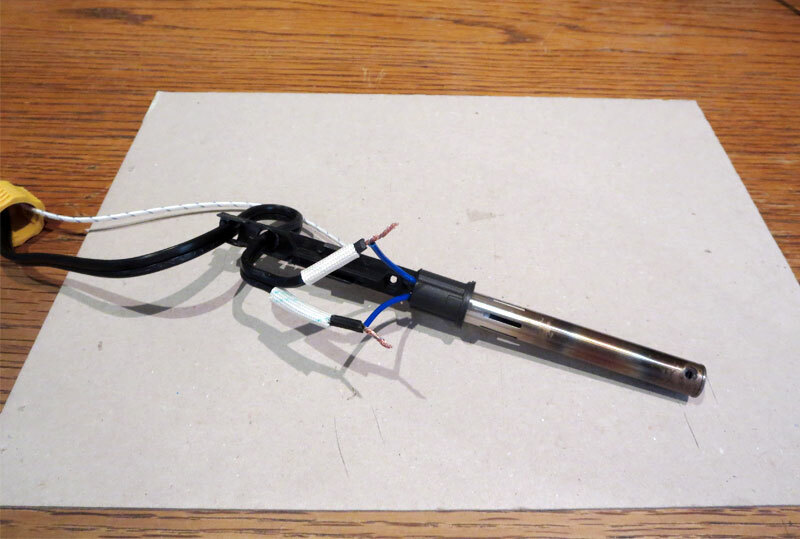 The 1/8 in heat shrink tube is then slipped over the 3/16 in heat shrink tube and the heat gun is used to secure them to the thermocouple cable. In the photo below the utility knife blade points to the position of the thermocouple tip inside the fiberglass sleeve, which is now secured into position. I used a small screwdriver to carefully thread the end of the fiberglass sleeve into the rear opening of the heating element. Varying the depth more or less into the heating element will give a reading of more or less temperature. Expect a bit of trial and error before working out the final position. A small zip tie was used for the first attempt at positioning the thermocouple. I had to disassemble and reassemble the unit a few times before finding the best position. I was planning to use two zip ties here so after a couple of tries I started to use two of them in case I found the right spot so I wouldn’t have to take it apart again. 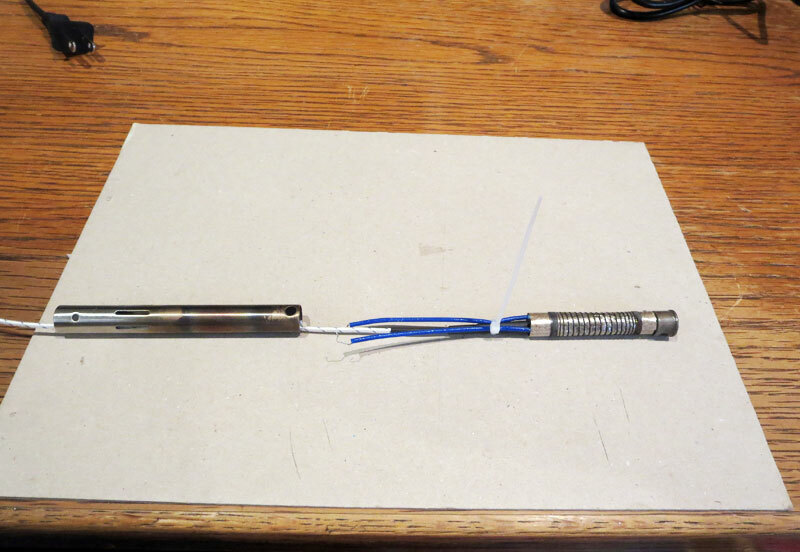 The heating element was inserted into the metal enclosure tube and together they were inserted into the round opening of the soldering iron handle insert. There is a hole in this part of the insert that needs to be aligned with a corresponding hole in the metal enclosure tube for the screw that fastens the parts together. It is helpful to temporarily fasten the parts together with the screw to maintain alignment while working on them. 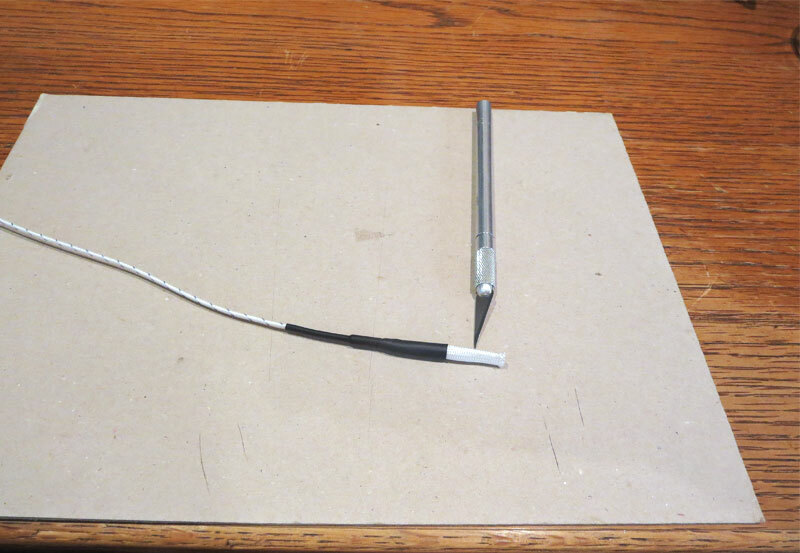 The heating element lead wires are then reconnected to the power cord conductors and twisted together like in the photo below. Slide the pieces of insulation back over the twisted wires. When the slack is taken up in the power cord these connections lay down flat into their own individual spaces in the handle insert. Take up all the slack in the power cord by pulling it through the slots in the handle insert. This is important for cord strain relief. Another view of the parts ready for final assembly. Carefully position the plastic insert back into the soldering iron handle so that the screw hole in the soldering iron handle lines up with the holes in the insert plus the metal enclosure tube. Use a screwdriver to tighten the screw (visible in the photo below on the desktop – click for larger view). Replace the soldering iron tip using the screws that were previously removed. This completes the reassembly. 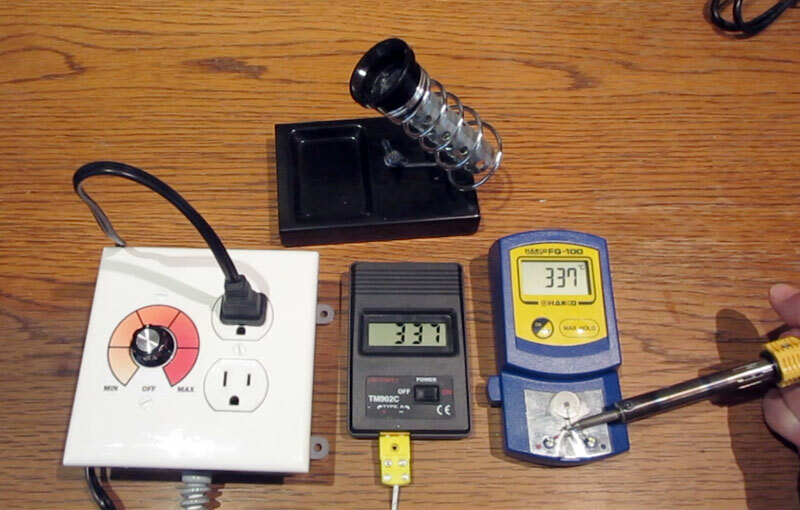 The unit should be tested with a K-type digital thermometer and the readings checked with a soldering iron tip thermometer similar to the setup in the photo below. 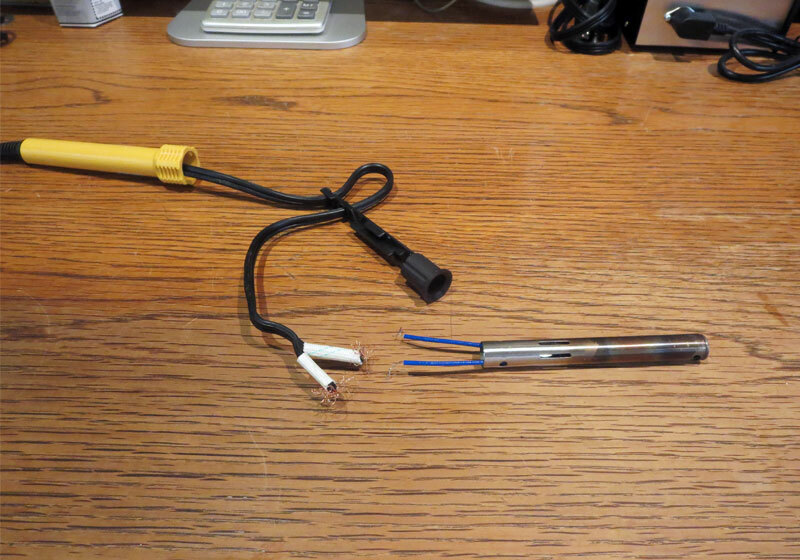 Insert the connector on the end of the thermocouple cable into the thermometer and plug the soldering iron into an AC outlet. I checked the unit with a dimmer switch. Please see the previous post on the DIY Analog Soldering Station. 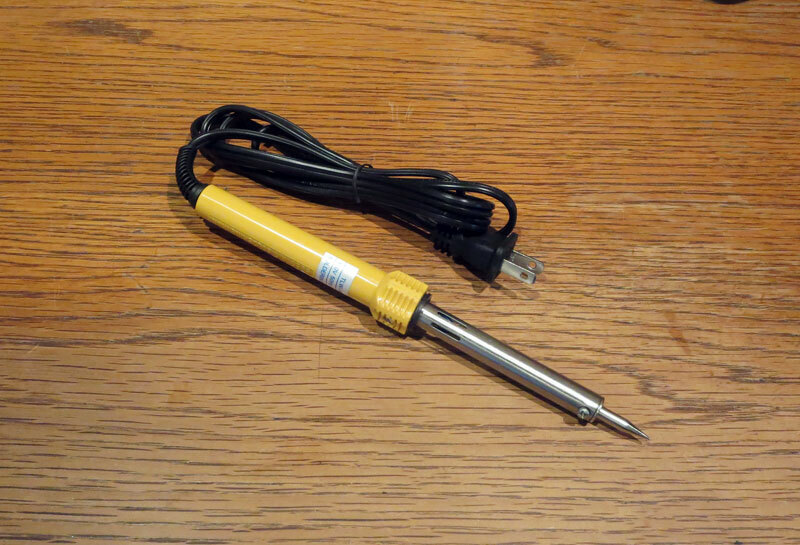 This soldering iron gets very hot and with the dimmer switch the temperature can be dialed down. In the photo below the dimmer is set approximately half way and the temperature was hovering around 340°C. 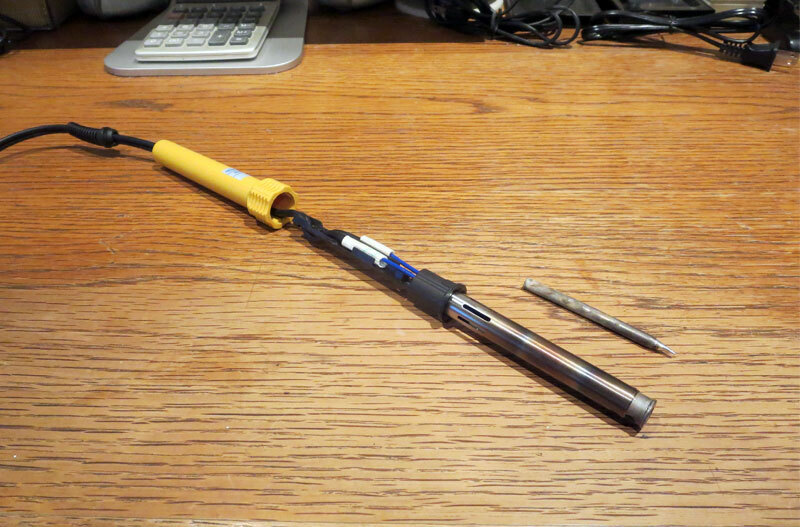 Adjust the position of the thermocouple inside the soldering iron according to the temperature readings in the test. The placement of the thermocouple at the rear of the heating element is critical. Expect a lot of trial and error to position it in the right place. In my case I disassembled and reassembled the soldering iron three or four times to find the right location for the thermocouple. Minor adjustments can be made without disassembling the unit by gently pulling or pushing on the thermocouple cable at the rear of the unit. Still, its positioning is very sensitive and a small change can have a big effect on the temperature reading. Some additional zip ties can be used to secure the thermocouple cable to the power cord to maintain its position more securely. This might be helpful to keep it from shifting around during normal use. The PID temperature controller I used is a Mypin TA4-SNR. This unit does not have a built in relay. 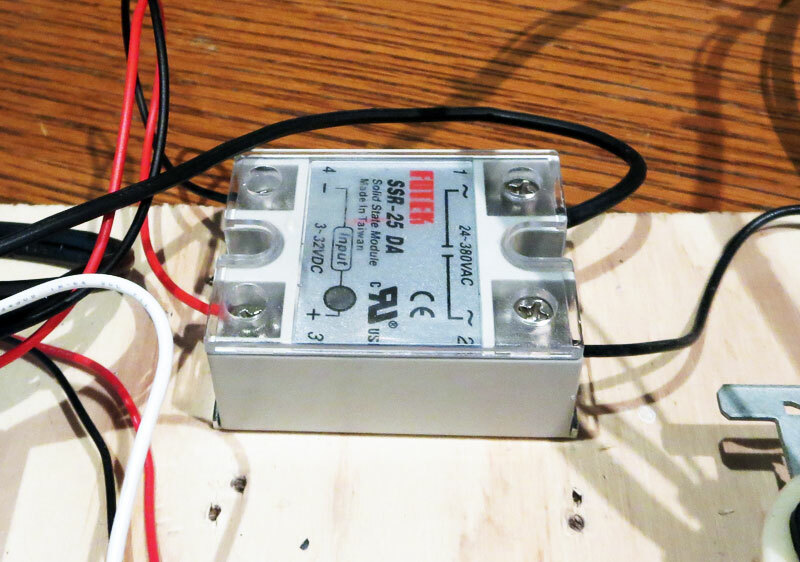 It requires a solid state relay (SSR) to switch power on and off to the soldering iron. It works with a K-type thermocouple and it has a temperature range from 0 to 1200°C. I got this unit from eBay for $19.69 USD. A label on the side of the controller has a diagram that shows how components are wired to the numbered terminals. The AC hot conductor was wired to terminal 1 and the neutral conductor was wired to terminal 2. 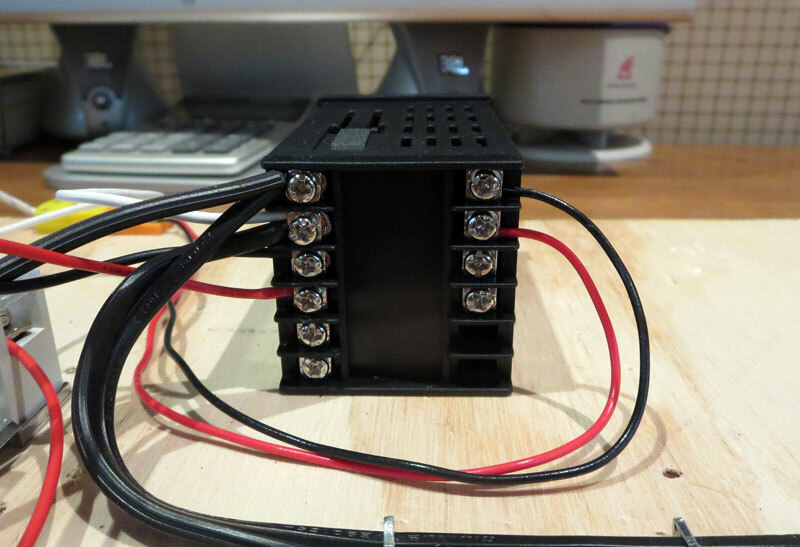 Below is a photo of the rear of the unit with the wiring terminals. 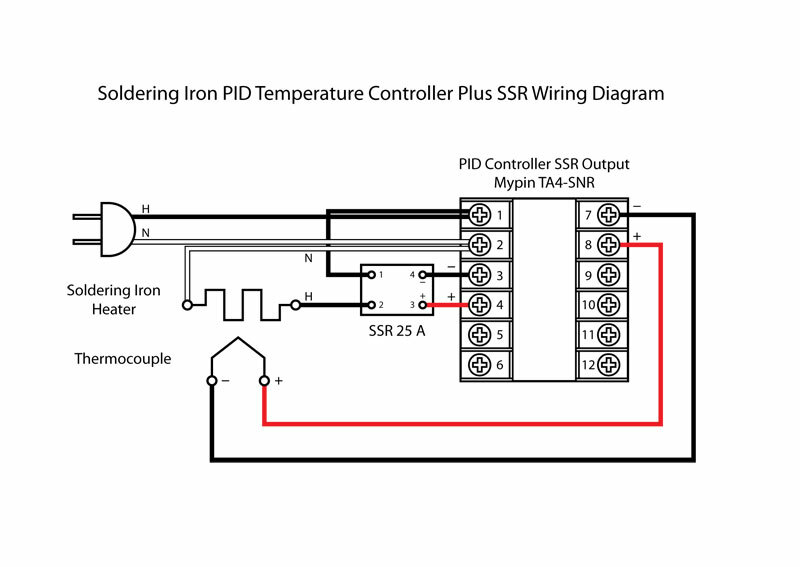 It is important to mention that the same model PID controller may have different wiring configurations and that the wiring label should be checked on the particular unit one is working with for how to make the connections. Below is a photo of the SSR used in this version. It is a 25 amp Fotek SSR-25 DA. It was available from eBay for $2.42 USD. The negative and positive wires from terminals 3 and 4 on the PID controller connect to the positive and negative terminals 3 and 4 on the SSR. A black wire is connected from the hot terminal number 1 on the PID controller to terminal 1 on the SSR. Another black wire connects from terminal 2 on the SSR to the hot side of an AC outlet on the test board. A white wire can be seen in the photo above that connects from the neutral terminal 2 on the PID controller to the neutral side of the AC outlet. Below is a wiring diagram of the circuit. Click for larger view. Shown below is a photo of the test board. The soldering iron is plugged into the AC outlet and the thermocouple is plugged into a female K-type mini connector. The female mini connector (orange plastic) is wired to the negative and positive terminals 7 and 8 on the PID controller. 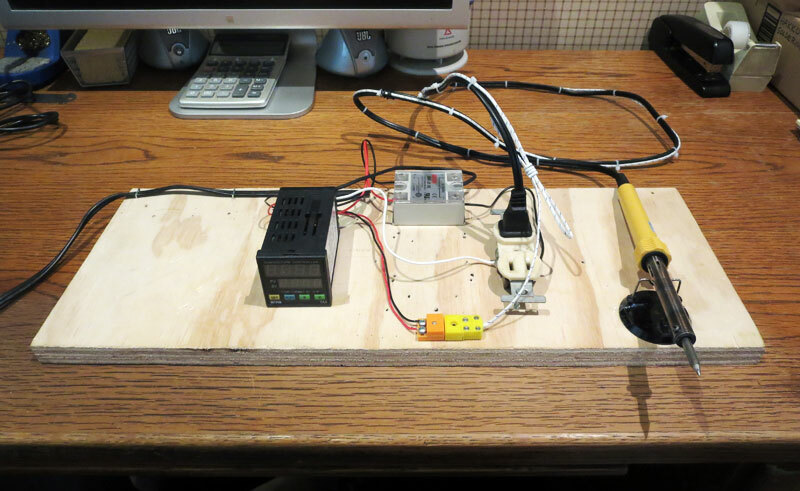 Another refinement that can be done is to even up the lengths of the power cord and thermocouple cable. 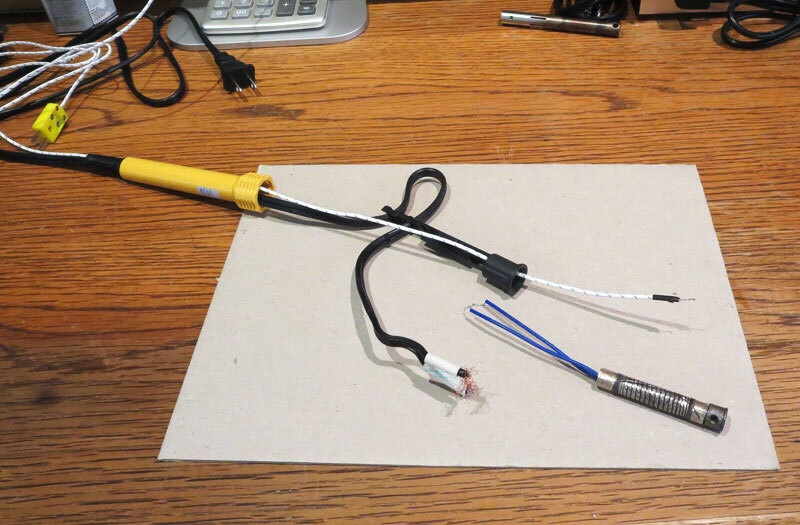 This was a two meter thermocouple and can be shortened a little bit to match the length of the power cord. The male mini connector is fastened to the cable with screws which are easy to remove and replace. The cable can be cut and then the wires can be reattached to the connector. Just make sure to maintain polarity. The conductors are positive and negative.